In Colorado, a sheriff’s deputy was shot and killed yesterday while responding to a call of an assault in progress, officials said. 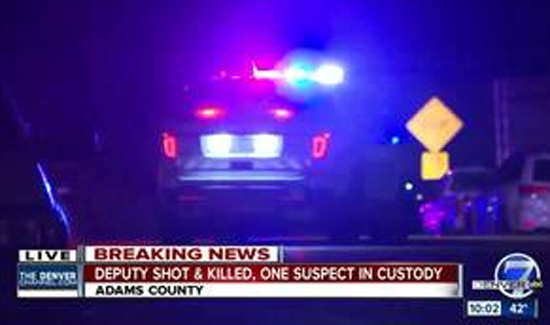 The unidentified Adams County sheriff’s deputy, was fatally shot in the chest after pursuing a suspect on foot in Thornton, Colorado. “When deputies caught up to the male, the male pulled out a handgun and started to shoot at our deputies,” fatally striking the officer, the Adams County sheriff’s office said in a statement. Shortly thereafter police found the suspect and took him into custody, the statement said. Police are still searching for two additional suspects. Both should be considered armed and dangerous officials said.